A European Commission (EC) delegation led by Gerassimos Thomas, the Commission's Deputy Director General for Energy, visited the NEA on 31 January 2019 for high-level discussions on the current state of nuclear technology and ongoing collaboration between the two organisations. Discussions also touched on the recent NEA studies on electricity system costs and the decarbonisation of electricity systems. The NEA wishes to thank the European Commission delegation for their visit, which enabled detailed exchanges of information and ideas. 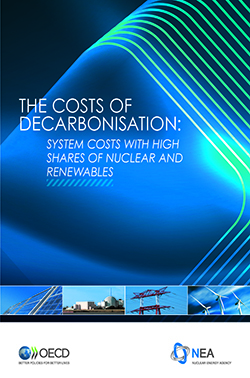 On 17 January 2019, the NEA will organise a webinar to discuss the findings from its latest report – The Costs of Decarbonisation: System Costs with High Shares of Nuclear and Renewables. This report assesses the costs of alternative low-carbon electricity systems capable of achieving strict carbon emission reductions consistent with the aims of the Paris Agreement. It analyses several scenarios of deep decarbonisation achieving the same stringent carbon emission target but characterised by different shares of variable renewable technologies, hydroelectric power and nuclear energy. The launch webinar will feature introductory remarks by the OECD Secretary‑General Ángel Gurría and NEA Director‑General William D. Magwood, IV, who will lead a discussion on the importance of system costs in assessing the overall costs of the energy transitions under way. Find out more and register at oe.cd/nea-system-costs-webinar-2019. 2018 was a very active and impactful year at the NEA. It marked the 60th anniversary of the Agency and brought other milestones, including the establishment of the new NEA Committee on Decommissioning of Nuclear Installations and Legacy Management. During this year, the NEA released flagship reports on emergency management, electricity costs, nuclear law and advanced nuclear fuels. It also organised events, conferences and workshops corresponding to the needs of member countries in the application and exploration of nuclear science and technology for peaceful purposes. The NEA sincerely thanks all of you for following us and for being part of the NEA community. Watch our year‑in‑review video here to see the highlights and key moments of 2018. NEA Director General Mr William D. Magwood, IV and senior staff visited China on 7-9 November for a series of meetings with various ministries and institutions, including the Ministry of Ecology and Environment (MEE)/National Nuclear Safety Administration (NNSA), the China Atomic Energy Authority (CAEA), and the National Energy Administration of China (C/NEA). Technical visits were also made to the China Institute of Atomic Energy (CIAE) and the Sanmen Nuclear Power Plant, where the world's first AP1000 third-generation nuclear reactor (Sanmen 1) is now connected to the grid. Discussions with the Chinese authorities covered a wide range of issues, including the electricity markets in China, nuclear safety culture, safety case for the disposal of radioactive waste, decommissioning and legacy management, stakeholder involvement and small modular reactors. Underlining the enhanced technical co-operation between the two parties, the first NEA-China Forum will be held in May 2019 with a focus on radioactive waste management and decommissioning. The European Nuclear Education Network (ENEN) and the NEA have signed a Memorandum of Understanding to co-operate in the field of nuclear education, training and knowledge transfer – an increasingly important concern for NEA member countries. The MoU aims to advance the ENEN and NEA's common aim of improving existing educational activities in the nuclear field, and maintaining the capability and expertise necessary to ensure the continued safe and efficient use of nuclear technology. ENEN and the NEA will cultivate joint efforts to develop education tools, approaches, methods and opportunities that will help foster the development of the next generation of nuclear scientists. 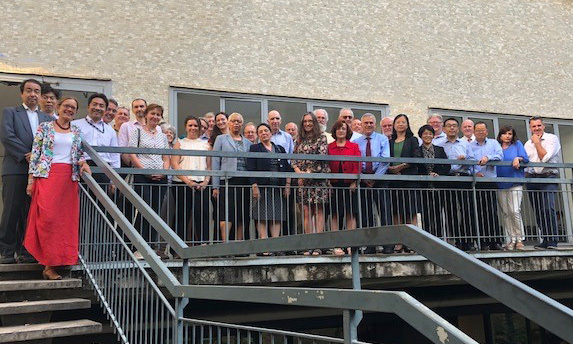 The NEA Committee on Decommissioning of Nuclear Installations and Legacy Management held a kick-off meeting on 16-17 October 2018 in Paris, France. In close co-ordination with other NEA committees, the new committee will lead NEA activities in the areas of decommissioning of nuclear installations and legacy management. Comprised of policy developers and technical experts representing regulatory bodies and implementers, the committee will facilitate comprehensive exchanges of national experiences and lessons learnt in the field. It will also provide a platform for NEA member countries to share information on national policies and best practices in order to advance the state of the art in decommissioning and legacy management. During this week’s kick-off meeting, the participants held operational discussions on the structure and governance of the committee, as well as on its guiding documents, including its mandate, statement and future programme of work. "The CDLM has been created to address an issue of growing importance for all NEA member countries - whether they are building new nuclear power plants or phasing them out," said the Chair of the CDLM kick-off meeting, Jean-Paul Minon. "This new committee will enable the NEA to assist its members in defining strategies to address a broader range of decommissioning and legacy management issues." China Atomic Energy Authority (CAEA) Chairman Mr ZHANG Kejian (张克俭), accompanied by the Chairman of the China National Nuclear Corporation (CNNC), Mr YU Jianfeng, and senior representatives from the CAEA and other Chinese organisations, held high-level discussions with NEA Director-General Mr William D. Magwood, IV, and senior staff on 12 September 2018. Their discussions focused on ongoing co-operation and technical exchanges within the framework of the existing Joint Declaration on Co-operation in the Field of Peaceful Uses of Nuclear Energy and opportunities for future co-operation. During the discussions, NEA Director-General Magwood noted that the collaboration between the NEA and China over the past five years has enabled valuable exchanges of information and ideas from which both NEA membership and China can benefit. China has sent representatives to a growing array of NEA meetings and fora and is a full participant in the Generation IV International Forum (GIF), the Multinational Design Evaluation Programme and the International Framework for Nuclear Energy Co-operation, three NEA-serviced bodies, as well as in seven NEA joint projects. The NEA Director-General and staff meet with Chinese officials and institutions on a regular basis and the Director-General is scheduled to visit China in November for further discussions and to visit one of the newly operational Chinese nuclear power plants applying the Generation III+ AP1000 technology. Mr Nobuhiro Muroya has been appointed Deputy Director‑General for Management and Planning. He took up his duties on 10 September 2018. Mr Nobuhiro Muroya will work closely with the Director‑General and the other members of the senior management team of the NEA, providing leadership and oversight of the management of the Agency to assure that it is working effectively and efficiently to meet the needs of its member countries. Prior to joining the NEA, Mr Muroya was the Minister's Secretariat at the Ministry of Education, Sports, Science and Technology (MEXT) of Japan. He previously supervised both the Secretariats of the Atomic Energy Commission (AEC), which directs the Japanese government's overall nuclear energy policy, and the Council for Science, Technology and Innovation (CSTI), which establishes national strategy for the advancement of science and technology. Mr. Muroya holds a Bachelor degree of Engineering from the Tokyo Institute of Technology and a Master degree of Public Policy Management from the University of London. NEA Director‑General Mr William D. Magwood, IV, and senior staff visited Korea in August for a series of meetings with various ministries and institutions, including the Ministry of Foreign Affairs (MOFA), the Nuclear Safety and Security Commission (NSSC), the Korea Atomic Energy Research Institute (KAERI) and the Korea Radioactive Waste Agency (KORAD). During his visit to the NSSC, he held his first meeting with the NSSC Chairman Kang Jungmin and discussed further enhancements in co‑operation between the NSSC and the NEA. While in Korea, Director‑General Magwood also participated in the World Nuclear University (WNU) Summer Institute as an invited leader and gave a presentation entitled "Looking Forward ‑ Nuclear Energy Issues and Opportunities". During his speech, he highlighted the need for nuclear innovation, the long‑term role of nuclear energy within the context of global climate change and the importance of attracting young people to study nuclear science and engineering. The NEA is one of the founding organisations of the World Nuclear University (WNU) Summer Institute. NEA Director‑General William D. Magwood, IV, and senior staff visited the Russian Federation on 26‑27 July for a series of meetings with the ROSATOM State Nuclear Energy Corporation and technical visits. Central to his visit were meetings with Mustafa Kashka, Rosatomflot Acting Director, and Vitally Trutnev, Director of ROSENERGOATOM Directorate for the Construction and Operation of Floating Nuclear Thermal Power Plants. The NEA delegation conducted a technical tour of Rosatomflot facilities and the Akademik Lomonosov, Russia's first floating nuclear power plant, which is currently being fueled in Murmansk. Technical visits were also made to Lenin Nuclear Icebreaker Museum and SevRAO, the northern centre of Rosatom subsidiary RosRAO which provides back‑end radioactive waste and decommissioning services for Russia's submarine fleet and commercial customers. NEA Director‑General William D. Magwood, IV, accompanied by senior staff, met with the European Commission Director‑General Dominique Ristori on 24 July 2018 to discuss the current state of nuclear energy, ongoing collaboration between the two organisations, and plans for further strengthening co‑operation in the future. Discussions with European Commission officials also covered the importance of ensuring an effective and efficient nuclear supply chain and the importance of maintaining nuclear technology skills capacity. While in Brussels the NEA delegation met with Pierre Jean Coulon, President of the European Economic and Social Committee (EESC) Section for Transport, Energy, Infrastructure and the Information Society. Mr Tadahiko Ito, State Minister of the Cabinet Office and of the Environment, Japan visited the NEA on 3 May 2018 to meet with NEA representatives including Deputy Director‑General and Chief Nuclear Officer Daniel Iracane, Deputy Director‑General for Management and Planning Masahiko Fujihara, and Deputy Head of the NEA Division of Radiological Protection and Human Aspects of Nuclear Safety Ted Lazo. State Minister Ito thanked the NEA for its contributions to the recovery of Fukushima after the Great East Japan Earthquake, and discussed possible follow‑up to the 2016 NEA workshop on "Post‑accident Food Safety Science" held in Fukushima. In particular, the Minister expressed his thanks for the NEA's support for the Soma Agricultural High School students who took part in the workshop, and underlined the importance of taking care of the younger generation during the Fukushima prefecture recovery process. The State Minister also gave an update on the impressive progress with off‑site decontamination in the surrounding areas of the Fukushima Daiichi Nuclear Power Plant and a nuclear emergency response exercise to be held in Japan later this year. Dr Iracane outlined ongoing work towards developing an international instrument to formalise the framework for post‑accident food management and the second NEA Workshop on Stakeholder Involvement in Nuclear Decision Making to be held in 2019. The NEA Steering Committee for Nuclear Energy held its biannual meeting on 19‑20 April 2018. Among the decisions taken, the committee approved the establishment of the new NEA Committee on Decommissioning of Nuclear Installations and Legacy Management, which will enable the NEA to assist its members in managing a broader range of decommissioning issues including the management of legacy sites and legacy waste. In forming the new committee, the NEA will convene a balanced composition of policy developers and experts representing regulatory bodies and implementers in order to facilitate comprehensive exchanges of experiences and best practices in the field of nuclear decommissioning and legacy management. Accordingly, the committee delegates will share their national expertise in decommissioning planning and strategies selection, as well as lessons learnt in managing decommissioning challenges. The new committee will co-ordinate closely with other NEA bodies, as well as with relevant activities in other multilateral institutions. Within the framework of the NEA CABRI International Project (CIP) a first test simulating a reactivity initiated accident (RIA) in conditions reproducing those in a pressurised-water reactor (PWR) was successfully carried out on 16 April 2018. The test was performed at the Cabri facility in Cadarache, France by the Institut de Radioprotection et de Sûreté Nucléaire (Institute for Radiation Protection and Nuclear Safety - IRSN), with the support of the French Alternative Energies and Atomic Energy Commission (CEA), in the new pressurised-water loop that was installed recently as part of a major renovation programme. The NEA CIP Project investigates fuel and cladding behaviour in PWRs during RIAs that involve a sudden localised accidental increase of core power that would arise from, for example, control rod ejection. The CIP began in March 2000 and two RIA tests using high burn-up PWR fuel were performed in 2002 in an experimental loop filled, at that time, with liquid sodium. "After ten years of major refurbishments, the Cabri reactor is now equipped with a new configuration that will enable the NEA CIP Project to study the safety behaviour of fuels in more fully representative PWR conditions," noted the NEA Deputy Director‑General and Chief Nuclear Officer Dr Daniel Iracane. "The successful completion of this test positions Cabri as a new major asset for the continuous enhancement of our knowledge base, and for the future of nuclear fuel safety worldwide." More information on the NEA CIP project is available here. The NEA co‑sponsored the International Youth Nuclear Congress (IYNC) 2018 conference, which was organised jointly with the 26th WiN Global Annual Conference in Bariloche, Argentina, on 11‑17 March 2018. The conference brought together young professionals and women in the nuclear field to discuss and to collaborate on knowledge transfer, nuclear science and technology research and implementation, professional development and communication. NEA Director‑General Mr William D. Magwood, IV, who was recognised as a key supporter who helped launch the IYNC almost 20 years ago, was a featured speaker in the keynote session on "Challenge the present, empower the future". During his speech, he highlighted the need for nuclear technology to evolve to meet future challenges and the importance of attracting young students to study nuclear science and engineering. He also noted that the NEA encourages its membership to explore ways of attracting, recruiting and retaining women in science and technology. Ms Yeonhee Hah, Head of the NEA Division of Radiological Protection and Human Aspects of Nuclear Safety, provided a keynote speech at the launch of the IYNC Mentor Program. She was also a featured speaker in the workshop session on "Strategic Communication in a Nuclear Crisis". While in Argentina, the NEA delegation visited the Embalse Nuclear Power Station, which is currently undergoing a life extension programme. On 20 March 2018, the NEA visited The National Nuclear Energy Commission of Brazil (CNEN) to participate in an information exchange seminar organised by the CNEN's Directorate of Radiological Protection and Security (DRS) and attended by representatives from important actors in Brazil's nuclear power programme. NEA Deputy Director‑General and Chief Nuclear Officer Dr Daniel Iracane presented the Agency's activities, its role among international organisations and its work on nuclear technology, safety and radioactive waste management. Discussions addressed a wide range of associated issues, including stakeholder involvement. During the seminar NEA representatives were also introduced to the main lines of nuclear energy policy, research and education in Brazil. While in Brazil, the NEA delegation also visited the Angra Nuclear Power Plant and other institutions in order to gain insights into nuclear technology in Brazil. The seminar and the visit were both very informative and constructive, and took place in a spirit of openness, and mutual recognition of the benefits of international co‑operation. The NEA wishes to thank the CNEN and the Brazilian Ministry of Foreign Affairs for the well‑prepared seminar and fruitful exchanges during the visit. 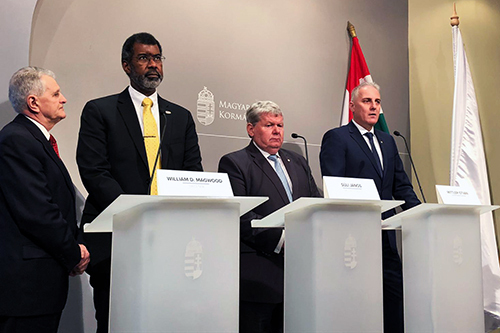 On 5-6 March 2018, NEA Director-General William D. Magwood, IV, undertook his first official visit to Hungary for meetings with the Ministry of National Development, Ministry of Foreign Affairs and Trade, the Hungarian Atomic Energy Authority (HAEA), Public Limited Company for Radioactive Waste Management (PURAM), the Hungarian Nuclear Society and the Hungarian Young Generation Network (FINE). Central to his visit were discussions with Minister János Süli (pictured on the right), Minister István Mikola, and State Secretary for Energy Affairs András Aradszki. While in Hungary, the Director General visited the Paks Nuclear Power Plant and various other nuclear facilities, including the CERES (Cooling Effectiveness on Reactor External Surface) facility, Budapest Research Reactor, PURAM Spent Fuel Interim Storage Facility, National Radioactive Waste Repository (NRWR) and the Hungarian Academy of Sciences Centre for Energy Research. On 6 March, he delivered the lecture “Addressing Global Nuclear Challenges in an Era of Change” to students and staff at the Institute of Nuclear Techniques (NTI) of the Budapest University of Technology and Economics (BME). The Director-General's visit to Hungary proved to be an excellent opportunity to exchange views on nuclear energy issues, education and research, as well as on how to continue strengthening the NEA's engagement with Hungarian entities. From 25 February to 1 March, NEA Director‑General Magwood led a high-level visit to China. Bilateral meetings were held with the Ministry of Environmental Protection (MEP), the National Nuclear Safety Administration (NNSA), the China Atomic Energy Authority (CAEA), the National Energy Administration (C/NEA) and the China National Nuclear Corporation (CNNC). Technical visits were made to the Qinshan Nuclear Power Plant and the Fuqing Nuclear Power Plant, where China is building the first Hualong One nuclear power reactor. The NEA delegation also visited some of the country's leading research centres, including the Shanghai Institute of Applied Physics (SINAP), which is leading China's development and demonstration of molten salt reactor technology; the Shanghai Nuclear Engineering Research and Design Institute (SNERDI) and the Chinese Academy of Sciences (CAS). On 28 February, Director‑General Magwood delivered a lecture on NEA work and activities to nuclear science and engineering students at Shanghai Jiaotong University (SJTU). The visit, which was very informative and constructive, exemplified the valuable exchange of information and ideas from which China and the NEA can both benefit. Highlighting the growing relationship between the NEA and China, the Agency will welcome in March a Chinese radioactive waste expert on secondment to work at the NEA in Paris for the next two years. She will be the first Chinese expert to join the NEA's main secretariat staff. In the post-Fukushima context, emergency preparedness and response (EPR) in the nuclear sector is more than ever being seen as part of a broader framework. In order to achieve an all-hazards approach to emergency management, a major step in the process will be to consider experiences from the emergency management of hazards emanating from a variety of sectors. The NEA thus joined forces with the OECD and the European Commission's Joint Research Centre (JRC) to collaborate on this report, which confirms similarities in EPR across sectors, identifies lessons learnt and good practices for the benefit of the international community and demonstrates the value of an all hazards approach. Download the report at oe.cd/nea-all-hazards-pub-2018. On 12 January 2018, the NEA will organise a webinar to launch its latest report – Towards an All-Hazards Approach to Emergency Preparedness and Response: Lessons Learnt from Non-Nuclear Events. This new NEA report promotes a comprehensive, all-hazards and transboundary approach to serve as the foundation for enhancing national resilience and responsiveness to emergency situations, created by natural, human-made, nuclear or non-nuclear crises. Built on contributions resulting from the collaboration between the NEA, the OECD and the EU Science Hub - Joint Research Centre, and enriched with a broad range of national experiences, the report will contribute to improve the preparedness of governments facing the challenges and societal expectations related to modern emergency crises. Find out more and register at oe.cd/nea-all-hazards-2018.